When parishioners come to worship at St. Andrew’s, beautiful stained glass windows surround us as we pray in the Nave and in the Prior Chapel. The windows were designed and constructed by the talented artist and long-time parishioner, Elizabeth Mears. After the final window was installed, a dedication ceremony occurred on June 14, 1994. The general theme for the windows in the Nave and in the Prior Chapel at St. Andrew’s is the salvation history of the church. Within this overall construct, each of the windows has its own subject. In addition, the windows are thematically linked by recognizable but non-representational images. There is no painting on the glass which might obscure the light entering the Nave. The windows are intended to carry on the tradition of teaching the story of salvation so that our children can be taught from them. 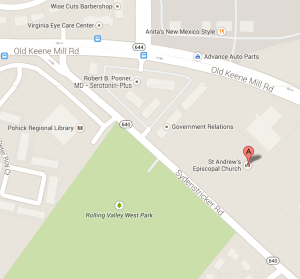 It was the intent of the committee (comprised of Elizabeth Mears, Rev. Prior, Martha Turner, and Donna Osthaus) that the windows would create a feeling of uplift and celebration, and that the glass used would not set the congregation of St. Andrew’s apart from the world outside. The glass chosen for the windows is handblown and imported from Germany, France, and England. It has a clarity of color which is almost jewel-like, and is semi-transparent; there are wonderful reams and striations which refract the light passing through and obscure images beyond. In descending order, the north windows in the Nave are: the Resurrection, the Law and the Prophets, the Exodus and the Creation. The east windows are: the Holy Spirit and the Life of the Church, the Passion, the Sacraments, and the Nativity. The two windows in the Prior Chapel are the Holy Cross, and the Holy Spirit. 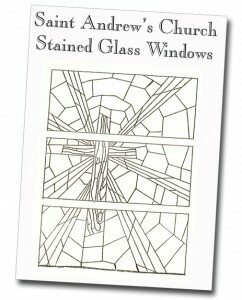 Booklets featuring the windows may be purchased from the church for a small printing cost, or can be downloaded without cost by clicking the pdf link on this page.